The cast control on standard fishing reels usually contains an array of tiny magnets. Since most CT multipliers are adapted from baitcasting reels, the braking force even at minimum setting tends to be heavy-handed for beach fishing. Contrary to common sense, a spool casting light plugs and lures relatively short distances usually needs heavier braking control than the same spool throwing a heavy chunk of lead vast distances. The first step in tuning a mag-controlled CT is to remove a few of the magnets in the array. Taking half of them out usually speeds up the reel enough yet retains enough braking to keep you out of trouble. For more performance, the next step is to replace the array with a single magnet. Not so along ago, this was an home engineering project unless you owned a reel such as the Penn 525 “T”, one of the few production reels with a tournament-grade magnetic system. These days you can buy a custom brake for DIY fitting to most CT multipliers, or have the reel worked on by a tuning expert, or even buy a reel such as the magnificent Rocket Reel F1 which is designed with all-out casting in mind. However you do it, you’ll end up with a quick reel – probably way too quick for everyday beach work. 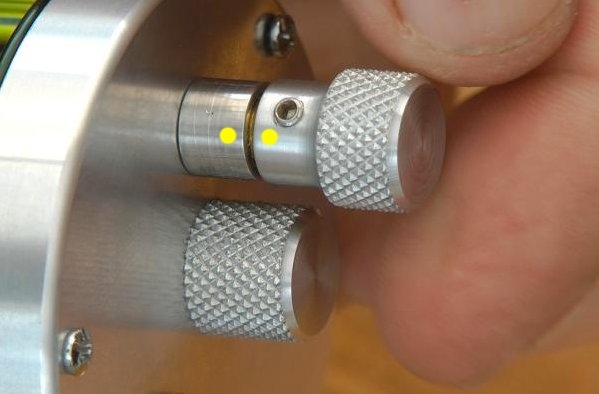 To be more exact, you’ll have trouble finding the right screw setting for reliable results at the low end. Such is the nature of single magnet controllers that a fraction of a turn can switch the reel from friendly to fierce. I don’t like messing about with reel adjustments while I’m fishing. With an add-on single-magnet system such as the Barbones sideplate conversion, it’s easy to dial in a little more brake when, for example, I’m casting a big bait into the wind. For sure, it’s more convenient to turn a magnet screw than to strip the reel and add a bigger block. But what I find difficult with single magnets is going back to the safe minimum setting when conditions improve. It seemed to me that some kind of speed limiter would help, so that the reel would stay fairly safe even if I accidentally wound the magnet screw a little too far out. The obvious answer was to put one small brake block into the reel’s centrifugal brake. With that installed, it doesn’t matter how far I back off the magnet; that little block is my safety net. For field casting, the block comes out again. Now the spool is free to spin as fast as I want it to go – right into the danger zone if necessary. I also put a couple of paint dots on the controller as a reference point. In my case, it’s the lowest magnet setting I find reasonably reliable for field casting without baits. This is my starting point for messing around with different tackle set-ups, and means I can easily go back to my baseline if things go wrong. Next Next post: Some old rods never die.